Unfortunately the "we don't need AC attitude" is quite prevalent in Europe, despite global temperatures that are constantly rising. We went to Copenhagen in May last year and it was sweltering. Hopefully Europe realizes that there is a global market for travel, and many Asians, Americans, Australians, and Middle Easterners are accustomed to and demand proper air conditioning. I am very happy to hear that the Al Maha has proper AC and am looking forward to my visit in March. We will be spending our first night at a Hyatt (probably Park Hyatt) and then ask the Al Maha to arrange a car to their property. What is a good time to travel between the two to avoid rush hour? We went to Copenhagen in May last year and it was sweltering. Are you having us on?! July peak for Copenhagen is around 18 celsius / 64F. As a Brit I'd be wearing a cotton sweater in that. Average in May is 12-13C (same as London today) which means wool sweater and coat. This compares to around 29c for New York over the Summer which is where your bio says you are. Hope you are aware that one (out of many) reasons for the global temperatures rise is the use of AC. And maybe keep in mind, the higher the temperature difference between inside and outside, the worse it will feel to your body when you have to get out of your room. Its just stupid to cool down rooms in summer to a lower temperature then in winter. margarita girl and EuropeanPete like this. In any case, this is the Al Maha thread so let me just say that I am happy to hear of the Al Maha's good air conditioning. Thank you to both IrishStephen and btonkid12345 - very much looking forward to going and glad to hear that there seems to be respect all round! Now wondering whether I should take the plunge and go for a king not twin?! Will decide by 5th Mar. Would having Marriott Gold get me anything at this property other than a welcome gift? Even Platinum doesn't get anything (upgrades to Royal Suite very rare, no late check-out) so I can't see what Gold can get you? Last year many places in Europe were hit by heat waves with much higher than normal temperatures. I dont doubt that the poster said they were sweltering in Copenhagen in May. In May 2017. many places in Europe the temperatures were much BELOW than normal. We were shivering in Poland - all locals we met told us the temperatures were 10 to 15 degree below normal. We did not get some warmth until we reach the Baltic countries by end of May. Due to Global weather disruption, the "normal" range of temperatures no longer is a reliable gauge, based on our trips traverse 3 Continents each year. Using an average chart to counter the poster's actual experience is meaningless because weather now changes every year, often to the extreme of the spectrum. And yes, hotels in Europe do not have AC on until after Mid May is a major pet peeve to us as well - what is the point to have in room thermostats control the individual room's temperature if everything is centrally control for the turning on of the climate control system be it heat or AC? There even How To Override Hotel Thermostat Settings found by googling - multiple of such videos. That tells you many guests have such needs. Even Los Angeles Times, a major newspaper in West Coast, has article addressed such. What the hotels and the modern hotels nowadays do, is to have the key card controlled electrical outlet. The Continental Europe in recent years are getting warmer and warmer - therefore hotels need to keep up with that. But what welcome gift you expect? It is an all-inclusive so any guest gets the 3 meals and 2 activities a day except the now chargeable sand blast (was free in the past). Well YMMV but some of us have gotten 4PM checkouts here. A hotel that is part of the Marriott chain does not have 90% European guests. They are a global hotel chain and they need to cater to global tastes, not only their local tastes, if they want to remain competitive. Also, it is funny that in Europe, they have in-room HVACs that allow a low set temperature, but even if you turn the fan on to the max, the room will never achieve that temperature. That means the system is not working properly, because if the system displays a temperature that it can supposedly achieve, it should be able to achieve it within an hour or two maximum (unless you are in 110+ degree F weather with blinds completely open or something). However, in Europe, they always claim the system is working properly and to just open the window if more cooling is desired, which is asinine. 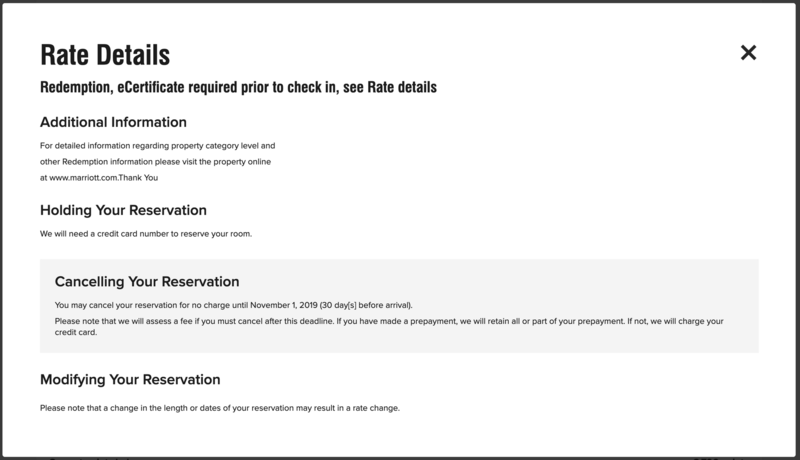 Points redemption reservation does not show full-board any more if you check the rate details. Can you post a screenshot? Mine does not imply anything about whether it is full or half board, it just has the redemption information. Right. Before it says "full board redemption" Today when I try to make some booking before cat 8 kicking in, I realized they get rid of the language of full board. I don't know if this is no longer full board or they are just not being explicit about it. All of my points redemptions now have the exact same language as the above screenshot, so it's probably something happening on the back end. I don't think Al Maha would be dumb enough to play the full board/room only games anymore after the backlash they got.